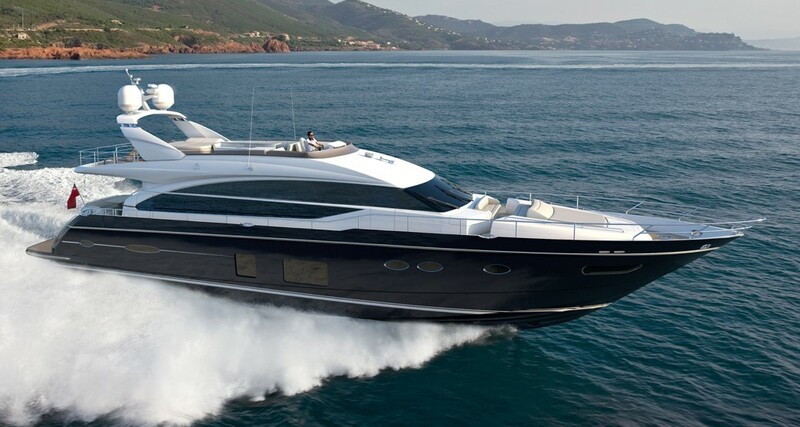 Princess 72 One of the finest Flybridge Motor Yacht models in the Princess fleet. Her distinctive stature effortlessly draws the eye from bow to stern, underlined by the innovative deep-V hull, a feature which also guarantees the class-leading agility and performance of the PRINCESS 72. The PRINCESS 72’s flybridge is well appointed, with a large wetbar, barbecue and generous seating to while away the day. This yacht represents everything to help you unwind and enjoy your guests' company to the full. With its welcoming ambience and homely feel, the PRINCESS 72 Motor Yacht is a truly inviting craft on which to spend time with friends. Light pours in through expansive windows down each side of the saloon, featuring a sociable galley that can be discreetly separated from the saloon behind an aft sliding glass screen. When evening falls, eight guests are able to relax in four spacious and well-appointed cabins, whilst for the owner, a luxurious full- beam stateroom beckons. This fine example of the PRINCESS 72 Motor Yacht is low hours and in splendid condition. She’s also one of the most comprehensively equipped pre-owned models available on the market.